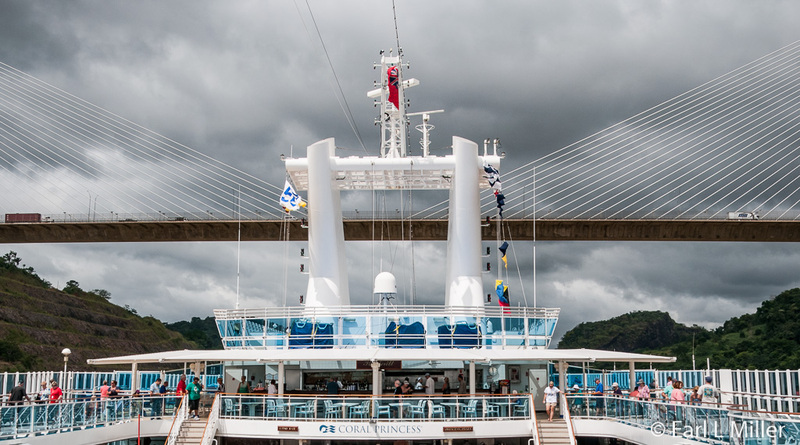 The highlight of any Panama Canal cruise has to be the trip through the canal itself. 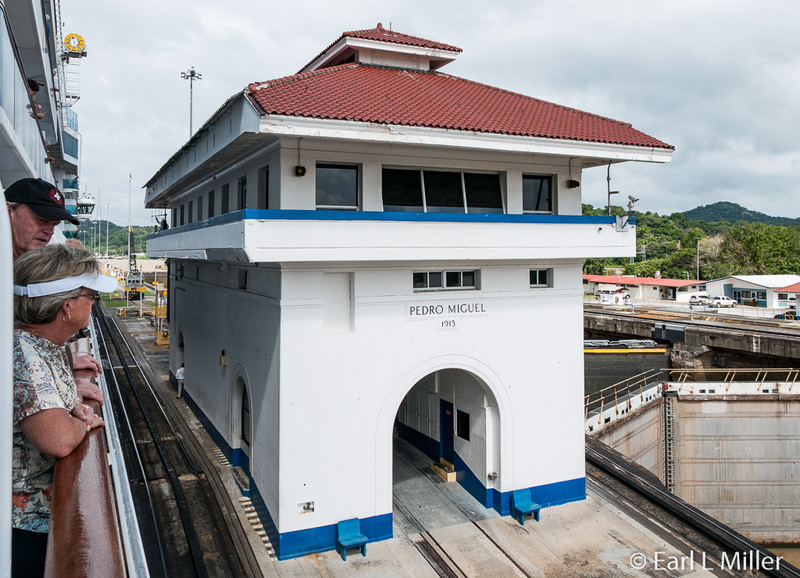 It’s hard to believe that this engineering marvel, which opened in 1914, still operates efficiently as it cuts across the Isthmus of Panama. It remains vital for maritime international trade, cutting off nearly 8,000 miles from a journey around the tip of South America. With the expansion, the canal should prove to be even more important. In 1513, Spanish explorer Vasco Nùñez de Balboa was the first European to discover the Isthmus of Panama was a slim land bridge separating the Atlantic and Pacific Oceans. In 1534, Charles V, Holy Roman Emperor and King of Spain, ordered a survey through the Americas. He was seeking a way to make it easier for ships traveling between Spain and Peru. However, his surveyors eventually decided the construction of a ship canal was impossible. In 1788, Thomas Jefferson suggested that Spain create a route through Panama’s isthmus. In 1843, Barings of London and the Republic of New Granada were interested in building a canal. They called it the Atlantic and Pacific Canal, a wholly British endeavor. Of course, these efforts never succeeded. The French became involved in 1877 when they surveyed the route. Ferdinand de Lesseps, a diplomat, was able to raise considerable finances due to profits generated by his successful construction of the Suez Canal. De Lesseps wanted a sea-level canal similar to the one at Suez. He did not understand the difficulties Panama’s topography and geography imposed. He ran into landslides and a massive rainy season where the Chagres River, where the canal started, became a raging torrent rising up to 35 feet. The jungle was filled with venomous snakes and spiders. The mosquitoes were the worst of all, rapidly spreading yellow fever and malaria which killed thousands of workers. French equipment of the era, even the steam shovel, was inadequate for the tasks ahead. The French effort went bankrupt in 1889 at a cost of the equivalent of 287 million United States dollars. Cost in lives was an estimated 22,000 lives from accidents and disease. De Lesseps; his son, Charles; Gustave Eiffel, who had been hired to construct the locks; and several others were indicted on fraud and mismanagement charges. They were sentenced to prison and fined, although the sentences were overturned. 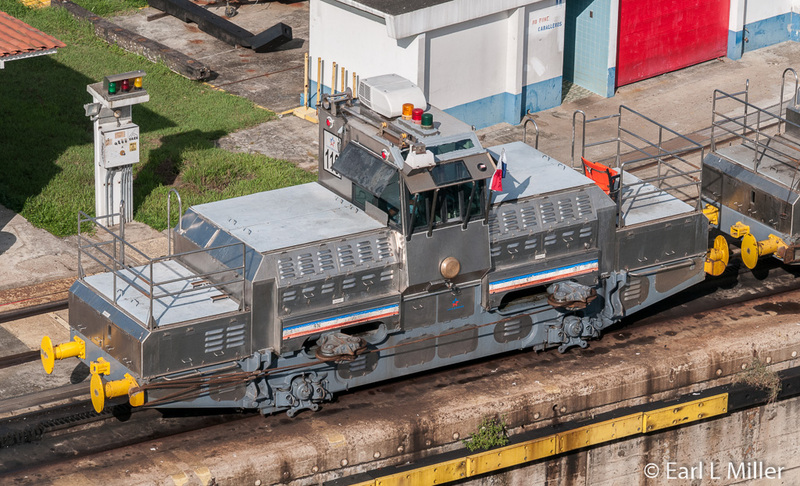 In 1894, a second French company, the New Panama Canal Company, whose president was Phillipe Beau-Varilla, was contracted to run the Panama Railroad and to maintain the existing excavation equipment. Bueau-Varilla believed a lock and lake canal was more realistic than a sea-level canal. Eventually, since the French could not succeed, the company tried to sell their assets for 109 million dollars. At that time, Panama was part of Columbia. President Roosevelt and the senate were interested in building a canal across the isthmus although some favored a canal across Nicaragua. Another group wanted to buy the French assets. Beau-Varilla then asked for 100 million dollars but accepted 40 million dollars. In June 1902, the United States Senate voted to pursue the Panamanian option if the necessary rights could be obtained. On January 22, 1903, United States Secretary of State John M. Hay and Columbia Charge, Dr. Tomás Herrán signed the Hay-Herrán Act. This granted the U.S. the right to build a new canal with a renewable lease, in perpetuity, from Columbia on the proposed canal land. The Senate ratified it on March 14, 1903. However, the Columbian Senate did not. Beau-Varilla told Roosevelt that a possible Panamanian revolt to separate from Columbia was about to happen. Roosevelt supported Panama’s separation from Panama, shortly recognized Panama and signed a treaty with the new Panamanian government similar to the Hay-Herrán Act. On November 2, 1903, he sent warships to block the path of the Columbia military. After a one day war, where only a donkey was killed, Panama declared independence on November 3, 1903. Phillipe Buneau-Varilla, Panama’s ambassador to the United States, signed the Hay-Buneau-Varilla Treaty granting rights to the United States to the canal property. In exchange, Panama received a one time $10 million payment and an annual annuity of $250,000. In exchange for being given control to the Panama Canal Zone in perpetuity, the U.S. guaranteed the independence of Panama. Many Panamanians, almost immediately, were not fond of this idea, regarding it as an infringement on their sovereignty. In 1904, the U.S. purchased the French equipment and excavations including the Panama Railroad for 40 million dollars. In 1921, the U.S. and Columbia signed the Thomson-Urrutìa Treaty where the U.S. apologized to Columbia, paying that country 25 million dollars. In return, Columbia recognized Panama as an independent nation. 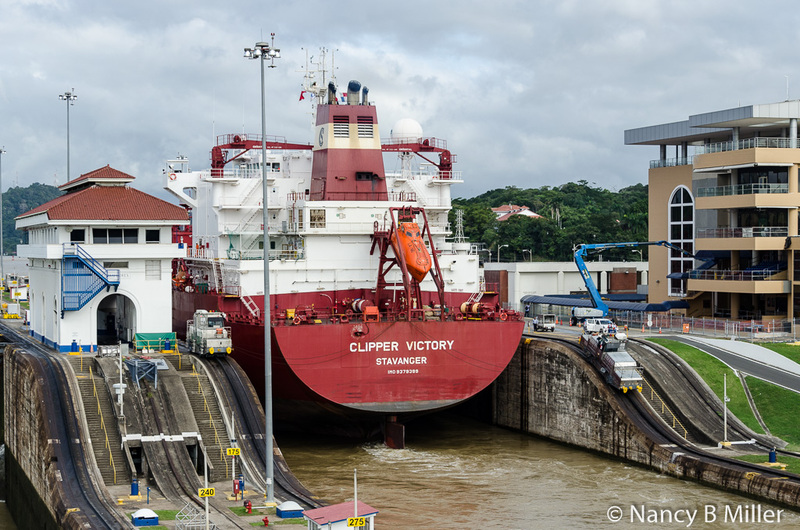 ​ On May 4, 1904, the U.S. took control of the property and established the Isthmian Canal Commission (ICC) to oversee construction and control the Panama Canal Zone. It was directed to avoid the French inefficiency and corruption. Roosevelt appointed John Findley Wallace, May 6, 1904, as chief engineer of the Panama Canal Project. Wallace was formerly the chief engineer and general manager of the Illinois Central Railroad. Wallace couldn’t handle the disease-plagued country, the use of the decrepit French infrastructure, or the ICC. He resigned in June 1905. John Frank Stevens succeeded him. He was the engineer who built the Great Northern Railroad. One of his first achievements was to rebuild as well as build the new housing, cafeterias, hotels, water systems, repair shops, and warehouses needed by the workers. He reestablished the railway that later proved useful in transporting tons of rocks and boulders from the cut through the mountains to the dam across the Chagres River. Colonel William A. Gorgas was appointed chief sanitation officer of the canal construction project in 1904. He immediately implemented measures to minimize malaria and yellow fever. A major job was eliminating mosquitos, which Dr. Carlos Finlay and Dr. Walter Reed had recently recognized as the cause of these diseases. Extensive sanitation projects were carried out including city water systems, fumigation of buildings, mosquito netting and window screens, and elimination of stagnant water. Gorgas received constant opposition from the commission but continued to carry out his projects. When Stevens arrived, he totally supported Gorgas. In two years, the mosquito-spread diseases were almost eliminated. Yet, 5,600 workers did die from illness and accidents during the U.S. construction phase of the canal. In 1905, a U.S. engineering panel formed a commission to review the canal design. No plans had been finalized. They recommended to Roosevelt a sea-level canal. However, in 1906, Stevens rejected the idea and favored one using locks to raise and lower ships from a large reservoir 85 feet above sea level. This would create the largest dam (Gatun Dam) and the largest man-made lake (Gatun Lake) in the world at that time. Gravity allowed water to propel into the locks from the lake. Gatun Lake would connect to the Pacific through the mountains at the Gaillard (Culebra) Cut. The Americans replaced the French equipment with their own. This consisted of such items as 102 new, large, railroad-mounted steam shovels, steam powered cranes, giant hydraulic rock crushers, cement mixers, dredges, and pneumatic power drills. The railroad was also upgraded. In 1907, Stevens retired. Men from the U.S. Army Corps of Engineers replaced him. U.S. Army Major George Washington Goethals directed the work to its conclusion. He was a civil engineer with experience in canals. He divided the engineering and excavation work into three divisions: Atlantic, Central, and Pacific. Major William L. Sibert, responsible for the Atlantic section, was in charge of building Limon Bay’s massive breakwater, the Gatun locks and its approach channel, and Gatun Dam. Sydney B. Williamson, responsible for the Pacific, was the only civilian. 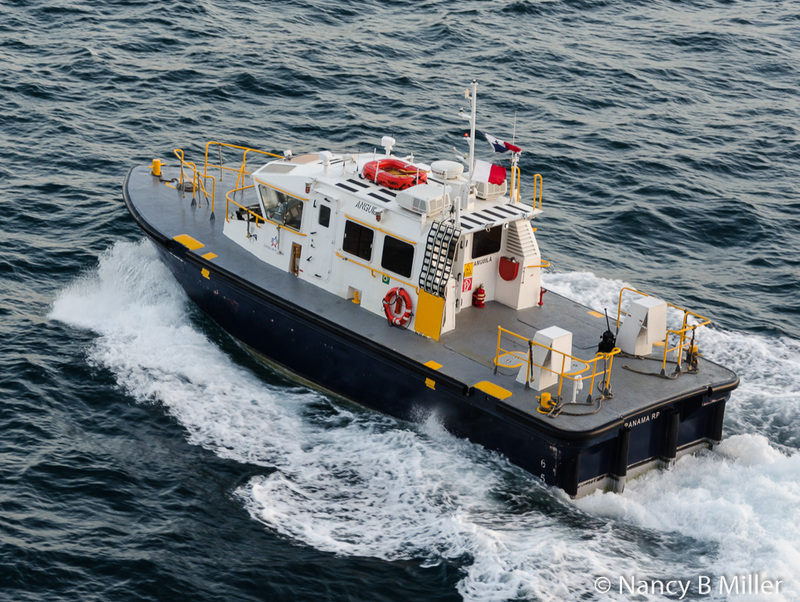 He was in charge of the breakwater in Panama Bay, the approach channel to the locks, the Miraflores and Pedro Miguel locks and their dams and reservoirs. Major David du Bose Gaillard had one of the most difficult parts, the Central section. He had to excavate the Culebra Cut through the Continental Divide to connect Gatun Lake to the Pacific Panama Canal Locks. On October 10, 1913, President Woodrow Wilson gave the signal by telegraph triggering the explosion destroying Gamboa Dike. This flooded the Culebra Cut and joined the Atlantic and Pacific Oceans. The canal was completed in 1914 at a cost of $375 million. It was the largest American engineering project to date. 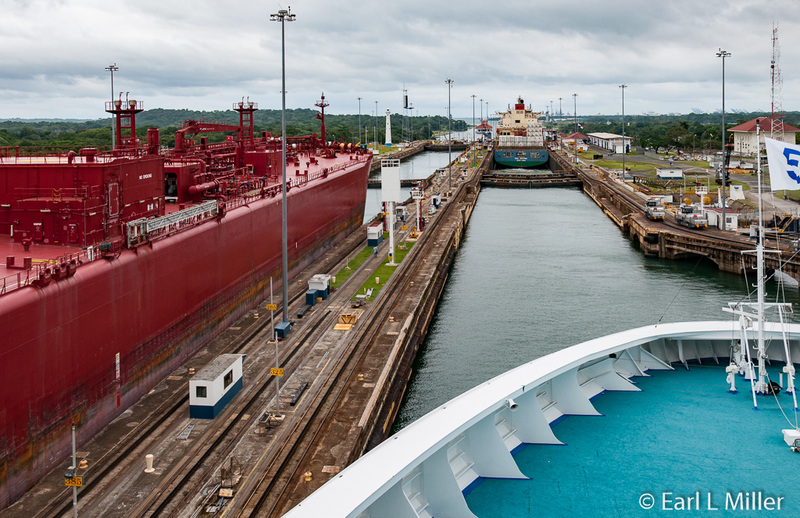 The canal officially opened on August 15, 1914 with the passage of the American cargo and passenger ship, SS Ancon. By the 1930s, the amount of water supply had become an issue. To answer this, Madden Dam was built across the Chagres River above Gatun Lake. It was completed in 1935. Tensions developed between the United States and Panama. In 1974, negotiations began which resulted in the Torrijos-Carter Treaty. It was signed September 7, 1977 by President Jimmy Carter and Omar Torrijos, the de factor leader of Panama. It granted the Panamanians free control of the canal as long as they guaranteed the canal’s permanent neutrality. 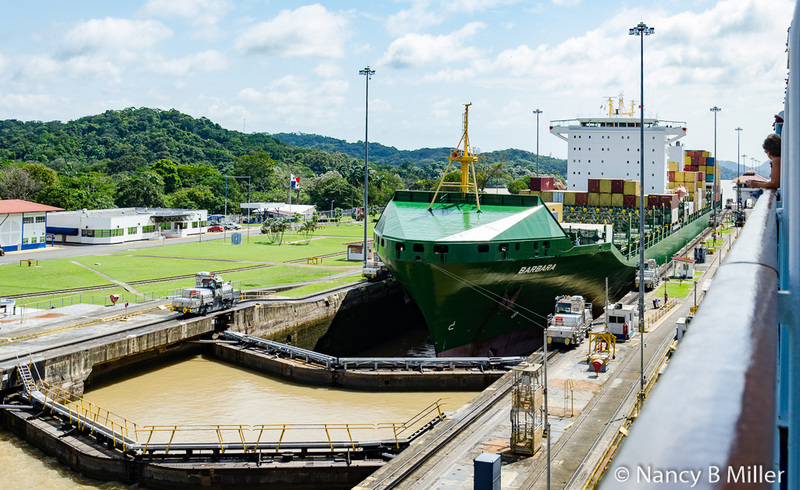 As of December 31, 1999, Panama took full control of the canal with the Panama Canal Authority assuming command. 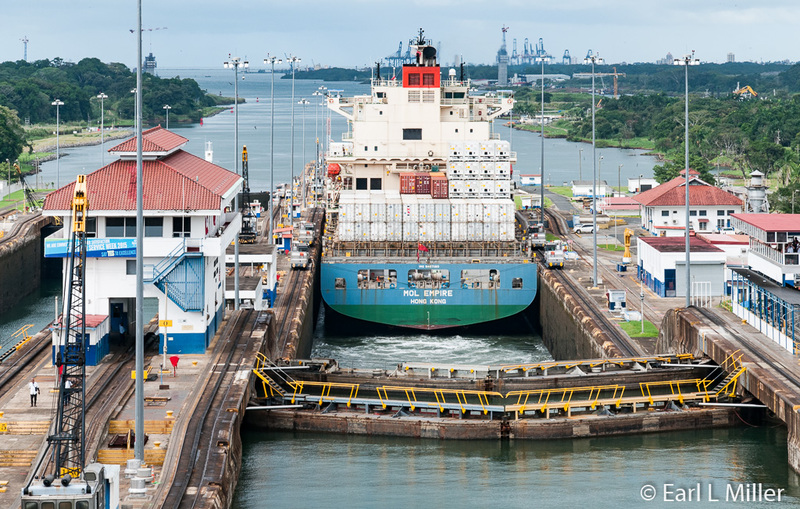 The money received from the canal is one of Panama’s chief revenue sources. The day you go through the canal it is essential to get up early to make sure you are in the front of the ship to photograph. Many don’t know but there are doors at the front of the Coral Princess that allow you to pass through and stand at the front of the 10th and 11th decks. I would suggest being there no later than 7:00 a.m. Beware that there are no places to sit down. I would presume this would be the same on her sister ship, the Island Princess. We traveled the canal from the Pacific to the Atlantic side, a trip of 50 miles. As we traveled through the Bay of Panama, I was surprised by the number of skyscrapers in Panama City. The bay’s numerous islands are a natural shield for the canal’s mouth. As with all ships, before we reached Panama City, a pilot assumed navigational control of the Coral Princess. His job was to guide our ship through the canal’s length to the Atlantic Ocean side. It’s a trip that takes eight to 10 hours. We passed under the Bridge of the Americas. 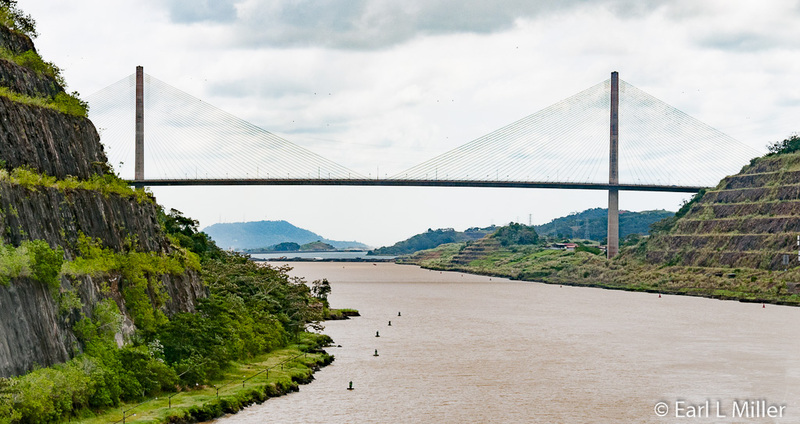 It’s located at Balboa, near Panama City and the start of the Panama Canal. Completed in 1962, with a total length of 5,425 feet in 14 spans, it is 384 feet above sea level. Ships crossing the canal are subject to this restriction. As you pass through the locks, you will see lines attached to locomotives (mules) whose job is to keep the ship centered in the locks. 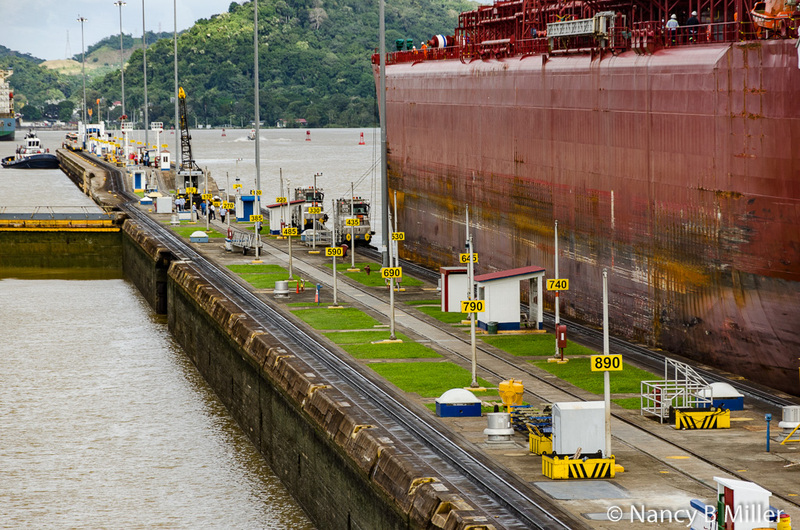 The Miraflores Locks consists of two steps. The locks are a total of 1.1 miles long with a total ascent of 54 feet at mid tide. 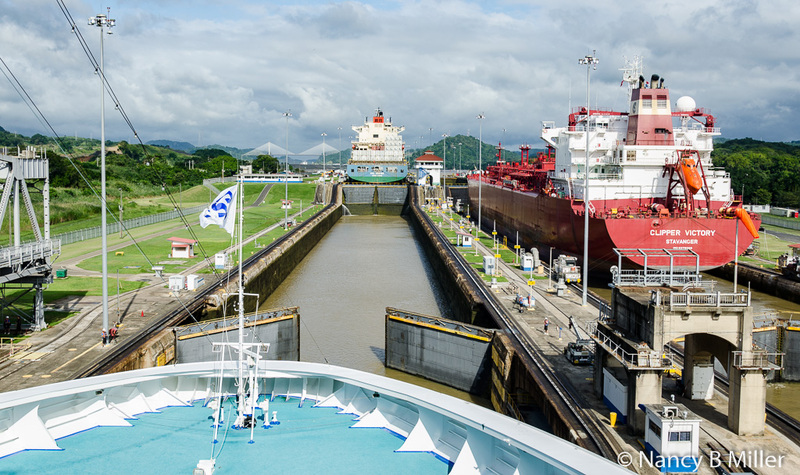 The Panama Canal locks’ size determines a ship’s maximum size that can pass through it. 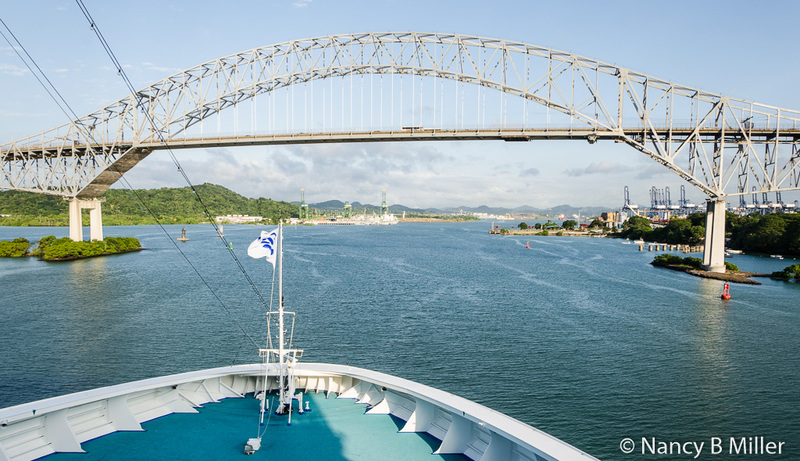 Panamax vessels, such as the Coral Princess, are built to the maximum size allowed. The locks are 110 feet wide, 1,050 feet long, with walls ranging in thickness from 49 feet at the base to 9.8 feet at the top. They are 45 feet deep. 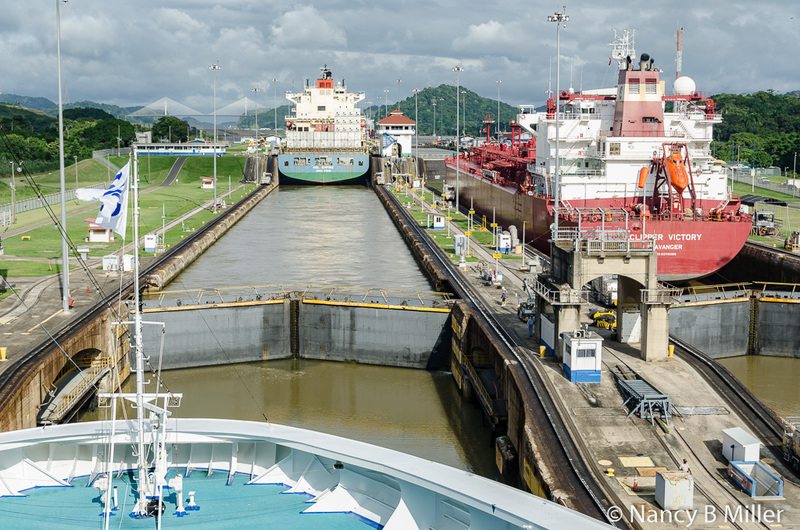 After passing through the locks, we navigated across 1.1 mile Miraflores Lake, a small, fresh water lake separating the two locks on the Pacific side of the canal. We soon came to the single-stage Pedro Miguel Lock. It’s .87 miles long and has a lift of 31 feet. This gives the two locks on the Pacific side a combination lift of 85 feet. We passed under the Centennial Bridge then through the 7.8 miles long Guillard Cut. The cut slices through the mountain ridge and crosses the continental divide. That bridge’s span is 3,451 feet. You soon pass into Gatun Lake, an artificial lake that was formed by the building of Gatun Dam. It’s a good place to take a break and go get breakfast at the Horizon Buffet as vessels travel for 15 miles across this point in the isthmus. It’s fed by the powerful Chagres River and emptied by the lock operations. It takes 52 million gallons of water from this lake for each ship to pass though the entire lock system.. 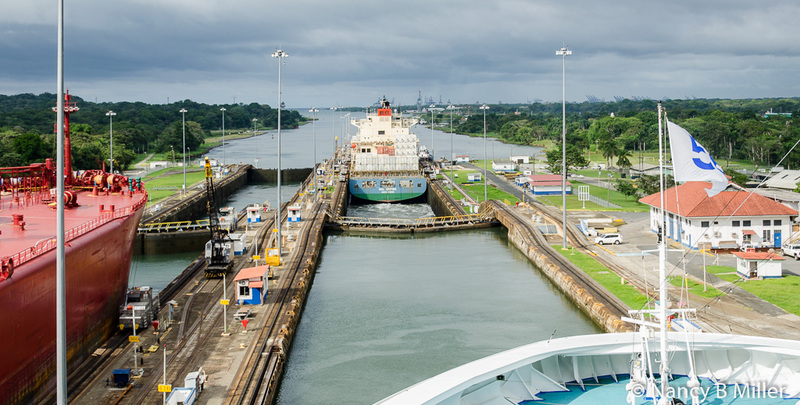 The final set of locks are the Gatun Locks which your ship will transverse in three-stages. They are 1.2 miles long, lowering your ship back to sea level some 85 feet. 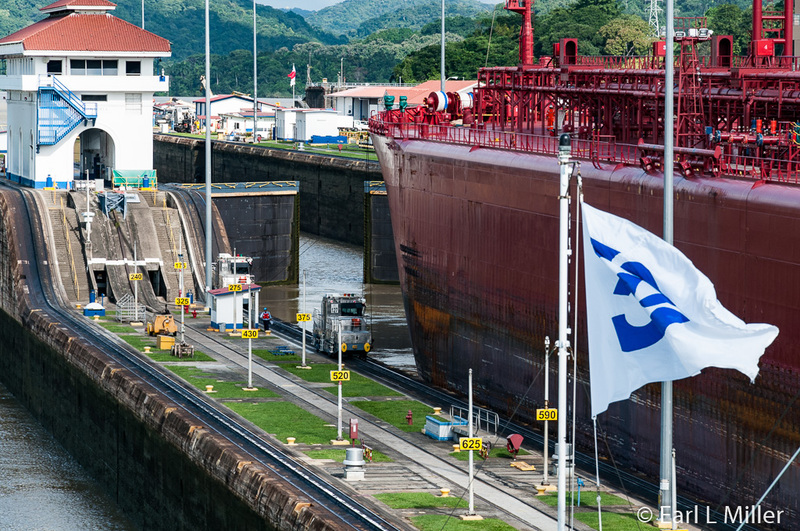 Canal tolls are set by the Panama Canal Authority based on the vessel type, size, and type of cargo carried. It’s calculated differently for passenger ships and container ships. Passenger ships pay according to the number of guests who can be accommodated in permanent beds. I have read that the toll per person is $134. The lowest toll paid for traversing the canal was 36 cents by American Richard Halliburton who swam the Panama Canal in 1928. The highest toll was by Disney Magic in 2008, $313,200. With the era of today’s behemoth ships, an increasing percentage are unable to use the Panama Canal Zone. In fact, more than a third of the bulk carriers, tankers, container vessels, and the biggest cruise ships are unable to do this. 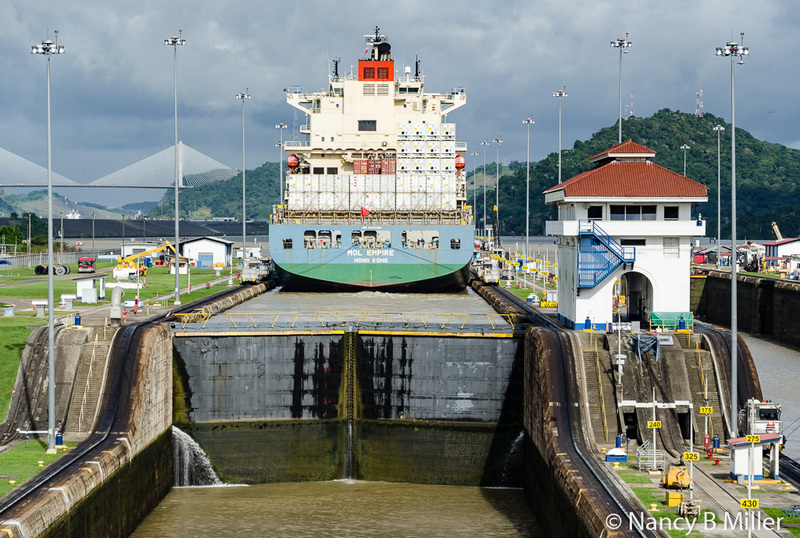 To solve this problem, the Panama Canal Authority decided to invest more than $6 billion to modernize the canal. This will double the cargo capacity of the old canal and make it possible to handle 99% of the world’s container ships and 81% of the huge liquidfied natural gas tankers - almost none of which use it now. 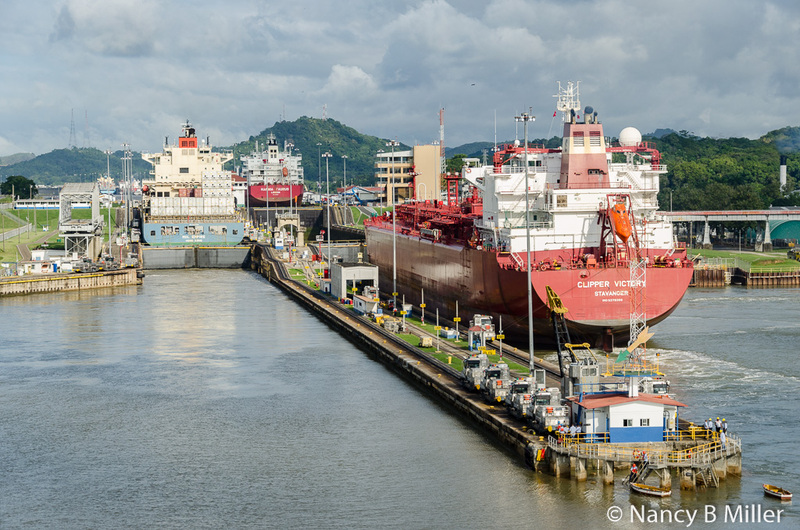 Work has been done to widen Guillard Cut, deepen the navigational channel in Gatun Lake, and deepen the Atlantic and Pacific entrances to the canal. Improvements have also been made to the canal’s operating machinery such as the tug locomotive fleet, the replacement of more than 10 miles of locomotive track, and new lock machinery controls. 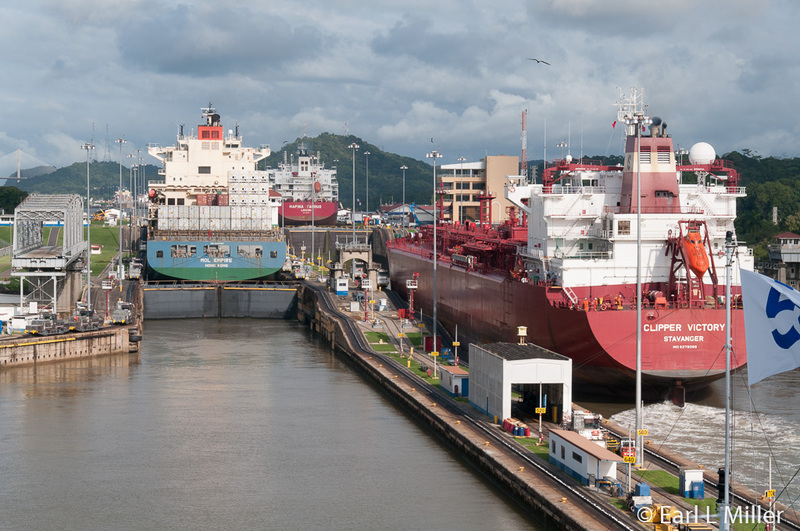 Improvements have been carried out to the traffic management system, allowing more efficient control over the ships crossing the Panama Canal. A Third Lock Scheme is being put into effect. Two new flights of locks are being built parallel to the old locks. All locks will continue to be operated. 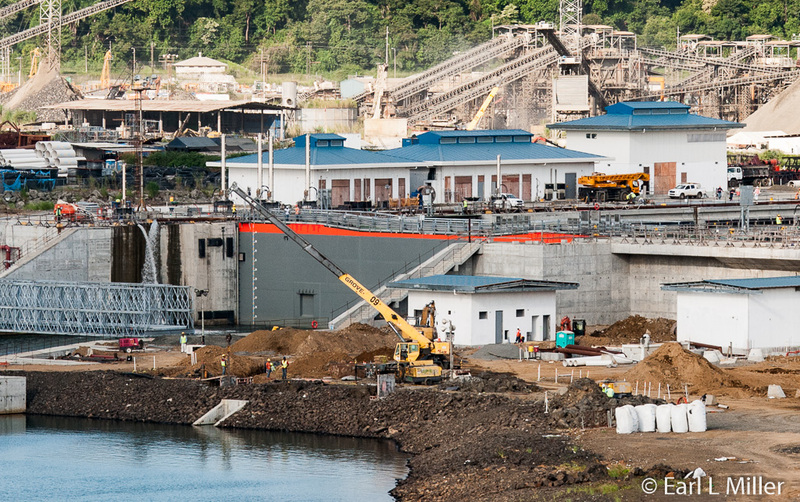 One new lock will be east of the Gatun locks and one southwest of the Miraflores locks, each supported by approach channels. Each will rise from sea level to Gatun Lake’s level without the two step process involved with Miraflores and Pedro Miguel Locks. The new lock chambers will feature sliding double gates which are 1,400 feet long, 180 feet wide, and 60 feet deep. This will allow the transit of larger vessels - those with a beam of up to 160 feet, length of 1,200 feet, with a draft of 49 feet. Tolls will depend on vessel tonnage, not the set of locks used. The expansion is also designed to save water. Gravity fed water-saving basins at each new lock will decrease the water loss and preserve the freshwater resources by reusing the water from the basins into the locks. Each lock chamber will have three of these basins and can then reuse 60% of the water in each ship’s transit. This will allow them to use 7% less water than the existing locks per transit. The project has a total of 18 basins. The deepening of Gatun Lake and the raising of its water level will allow for significantly more water storage. These measures will allow the expanded canal to operate without building new reservoirs. The new set of locks is to open sometime in 2016. A definite date has not been established yet. The Chinese have talked with the Nicaraguan government about building a canal through that country. Yet how far that project will succeed is yet to be determined.